These keepsake envelopes easily adhere to your memory book or scrapbook pages so that you can store precious mementoes in your album without the risk of falling out! Use these envelopes to store a first lock of hair, first tooth, hospital bracelet, or other special keepsakes from your baby's days. Each package contains (4) small 2"x2", (3) medium 2"x4", (2) large 3.5"x4" and (1) jumbo 4.5"x5" keepsake envelopes. Self-adhesive, resealable flap, acid free and archival safe. E-Z Dots is now new and improved, with a more durable liner and 15 additional feet of adhesive! Everyone can benefit from adding E-Z Dots to their adhesive collection. E-Z Dots dispenses translucent dots of repositionable adhesive that will simply come off at any time with a swipe of the finger! Economical, value priced refills are easy to change, use, and easy to dispense with the new ergonomic shape of the dispenser. Designed to utilize low waste and recyclable refill cartridges. Mix and match - one dispenser holds any refill. The refills can even be switched mid-use - no winding, threading, or tangling! No paper based liners that snap! A set of covers for your Tessera book. All Tessera Memory book covers are interchangeable, so if something happened to your old covers or you'd just like to change it up, look no further! A set of 45 acid free page protectors that fit perfectly over each Tessera Memory Book page. Kids love to look through their baby book, these page protectors keep pages clean and preserved. Twelve acid free, archival safe photo pages. Each page contains six 4 x 6 photo pockets for a total of 72 photos, plus additional pockets for writing notes. 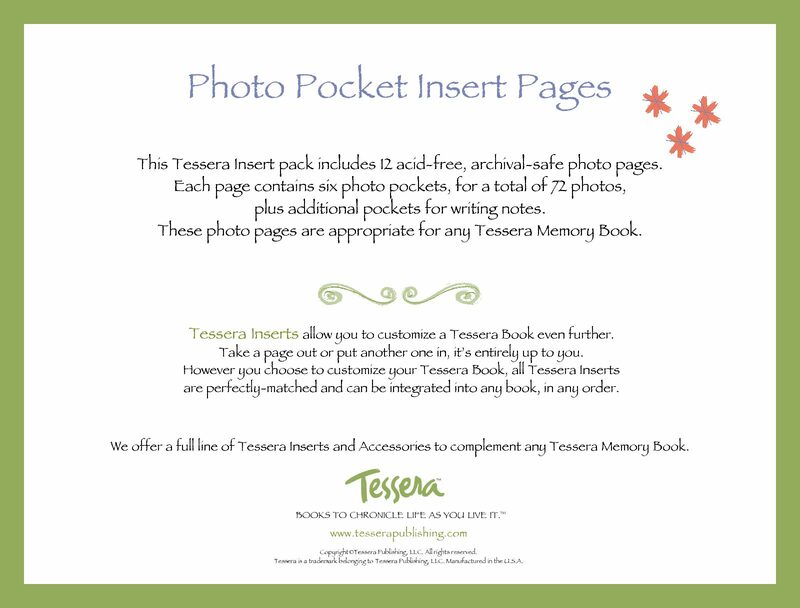 These photo pages will fit all Tessera Memory Books. Enhance your Memory Book with a plaque for the cover! The 3X2 Gold Brass Plaque will easily adhere anywhere on your Memory Book with a full backing of adhesive that will help the plaque stay in place permanently. We can engrave your plaque for you for an additional $10.00 fee. Select "Yes" from the Engraved option area and then input the lines of text you'd like for us to engrave. Enhance your Memory Book with a plaque for the cover! The 3X2 Silver Brass Plaque will easily adhere anywhere on your Memory Book with a full backing of adhesive that will help the plaque stay in place permanently. We can engrave your plaque for you for an additional $10.00 fee. Select "Yes" from the Engraved option area and then input the lines of text you'd like for us to engrave. Enhance your Memory Book with a plaque for the cover! The 4X3 Gold Brass Plaque will easily adhere anywhere on your Memory Book with a full backing of adhesive that will help the plaque stay in place permanently. We can engrave your plaque for you for an additional $10.00 fee. Select "Yes" from the Engraved option area and then input the lines of text you'd like for us to engrave. Enhance your Memory Book with a plaque for the cover! The 4X3 Silver Brass Plaque will easily adhere anywhere on your Memory Book with a full backing of adhesive that will help the plaque stay in place permanently. We can engrave your plaque for you for an additional $10.00 fee. Select "Yes" from the Engraved option area and then input the lines of text you'd like for us to engrave. All Tessera Books come with one set of screw post extensions. Screw Post extensions will hold an additional three insert packs in your book. If you are ordering less than three insert packs, you don't need to buy the screw post extensions. You can simply remove the cardboard spacers in the binding of your book. Personalize your Memory Book cover! Text or a monogram will be hand layered onto your book, or order a personalized plaque for a book you already have. We will send you the plaque with a full backing adhesive for you to affix to your book. We'll also send you a template so you can place easily place it in the center of your book.